Have you ever had that experience where you walk by a storefront and realize that something just caught your eye? You think about it for a moment, then just know that you have to go back and find out more about the object in question. That happened to me on a recent Sunday-afternoon stroll down First Avenue in downtown Seattle. We walk there often since it is part of our neighborhood, which is known as the “West Edge” because it is on the western edge of the city adjacent to Elliott Bay. The store in question was Design Within Reach, a long-time favorite. We have purchased everything from flatware to bath towels and even our living-room sofa there over the years! The object that caught my eye was a vase with a clear-glass bottom and a brass circle rising from the center. Various dried flowers stuck up from the holes in the brass circle forming a pleasing pattern. Once inside, the salesperson informed me it was Design Within Reach’s brand-new “Ikebana Vase.” Imagine my delight to learn that a principal I often use in my flower arranging (ikebana) was now incorporated into an actual vase sold by one of my favorite retailers. I learned that the vase comes in a large size (like the one in the window) and a smaller one. 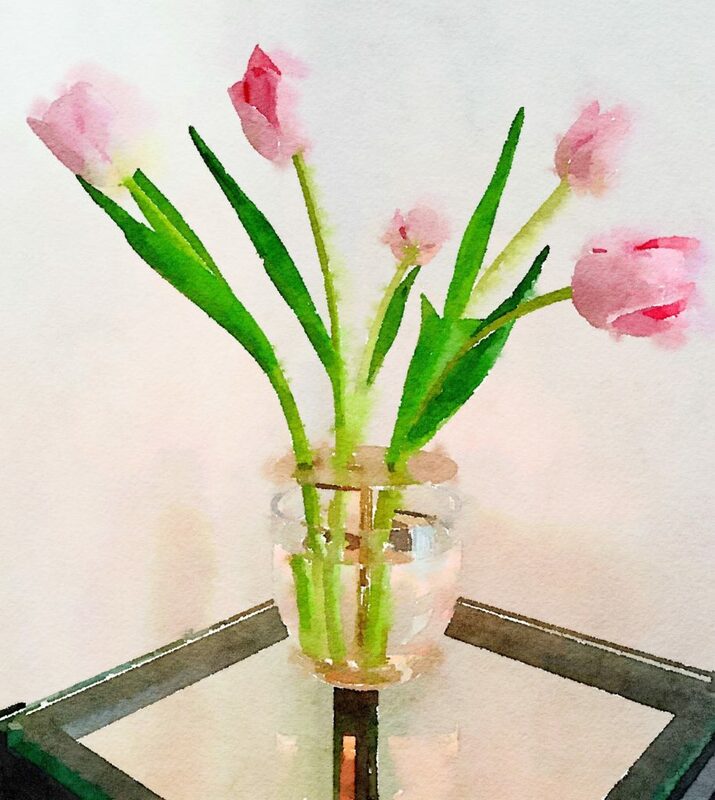 Knowing I would want to photograph the vase on our metal etagere (where I take many of my flower photos for posting on the Braiden Blossoms blog), I chose the smaller version because I knew it would fit better and be a better scale for the space. In other words, unlike more conventional vessels, the Ikebana Vase honors the whole flower and not just the crown. The two drilled plates are made of stainless steel covered with brass. They will scratch and age and develop a rich patina over time. The brass plates are designed for exact positioning of each blossom (in order to create precise arrangements). I was sad when the salesperson informed me that there was no small vase I could take home with me that day. Rather, as has become customary with many retailers in the modern world, my merchandise would have to be ordered from the Design Within Reach warehouse in Kentucky. The salesperson said the delivery would take five to seven business days. Disappointed, but excited to see the Ikebana Vase whenever it arrived, I put my new purchase out of my mind. Several days later, on the Saturday before Easter, I got notice that a package had arrived at our condominium’s front desk. When I saw that the big box was from Design Within Reach, I got really excited and hurried to cut it open. The Ikebana Vase itself came in a gorgeous robin’s-egg blue box, similar to those from Tiffany & Co. A good beginning! The glass base was thick, well formed, and beautifully crystal clear. It reminded me of a giant camera lens. The brass circle insert where the flowers would stand was easy to put together and felt strong and solid as I carefully positioned it in the base of the vase. Luckily, I had some fresh pink tulips on hand that I knew would work well in my new vase. Here is the photo of the fresh tulips in the new vase. I could hardly wait to “paint” my original photo using my beloved Waterlogue app. Here is that image in Waterlogue’s Vibrant mode. And here is the raw photo “painted” in Bold mode. This is Waterlogue’s Color Bloom mode. All are gorgeous and I love my new vase!